Facebook has just confirmed with me that it is launching a retweet-style “Share” button for the mobile news feed. The much-requested feature is now rolled out for the mobile site, and will soon come to the iOS and Android apps. Like the web version, it lets people take links and photos posted by someone else or even a Sponsored Story ad and quickly repost it with optional commentary. To try out the Share button, go to m.facebook.com and scroll through the feed until you see a story about a link, photo, video, or public status update posted by one of your friends or Pages you Like. The Share button is in the bottom right next to the Like and Comment buttons. It brings up a composer where you can add an optional description. When shared, the story will show “via [name of who originally posted it]”. The new mobile Share button shouldn’t come as much of a surprise. It’s one of the most requested features. At at talk in September, when asked about whether a Share button was in the works for mobile, one Facebook mobile manager said “I want to use it. We build products that we want to use.” The team also remarked that there weren’t technical limitations stalling it. That means Facebook was likely mulling over the impact it would have on the atmosphere of the news feed. Right now, most content shared to Facebook is relatively unique. Occasionally popular articles or memes get shared by lots of friends, but that’s a coincidence. When people do use the Share button on the web, they often give their own description of a link. But on mobile where typing is more of a pain, a Share button could encourage people to rapidly re-share link after link. That might make the feed seem repetitive and impersonal. Similar to the low-friction, easy-to-tap retweet button on Twitter mobile, Facebook users might Share instead of Liking. Advertisers and marketers might be A-OK with that. Share buttons also appear on stories with internal links to Facebook Pages. Share could make links posted by Pages a lot more viral on Facebook. 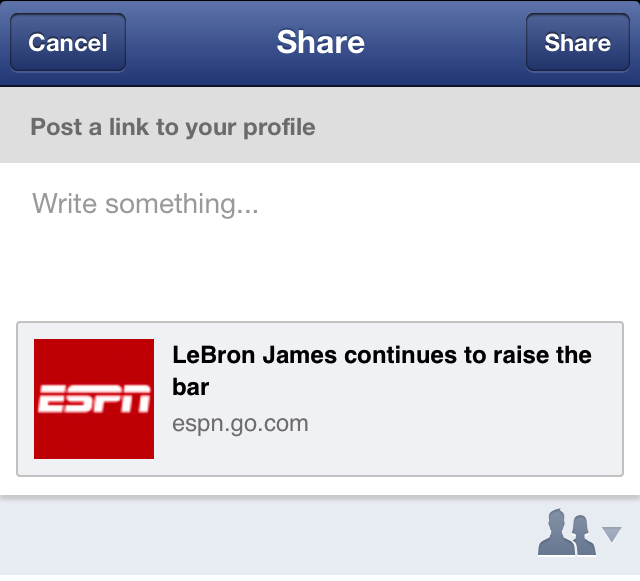 Finally, users can also Share ads they see in the news feed that are Sponsored Stories of links. Facebook is surely monitoring the effect the mobile Share button has to make sure it doesn’t degrade the quality of the feed. One benefit it could have, though: you might start seeing from outside your personal social graph, which could expand your perspective on the world. Like seeing retweets of people you’d never follow, Share could bring dissenting opinions about world news and social issues to your feed. Oh, and your memes and cat photos are going to go viral like never before.